At Stardog we use a number of third-party applications to make our lives a little easier. One problem we discovered, however, is that these applications often won’t talk to one another, and in some cases they don’t expose an API so that we can easily get them into our workflows without manual intervention. 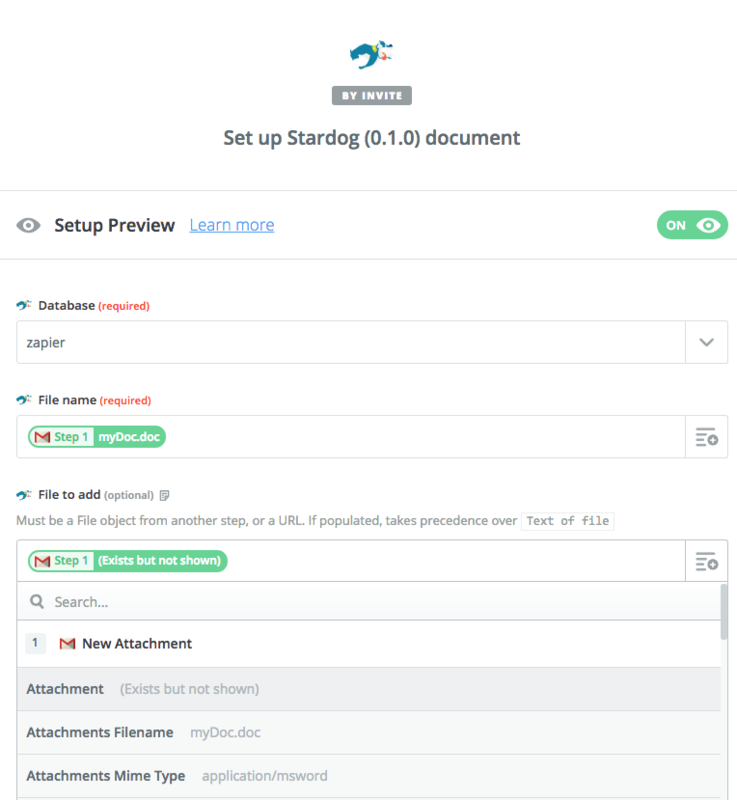 We came across Zapier, and have found it to be quite helpful with automating our workflows, and we decided that our users might want to get Stardog integrated into theirs! Triggers: Zapier polls a source application (or, in some cases, the source application pushes data to Zapier directly). Upon receiving new data, the Zap will begin. 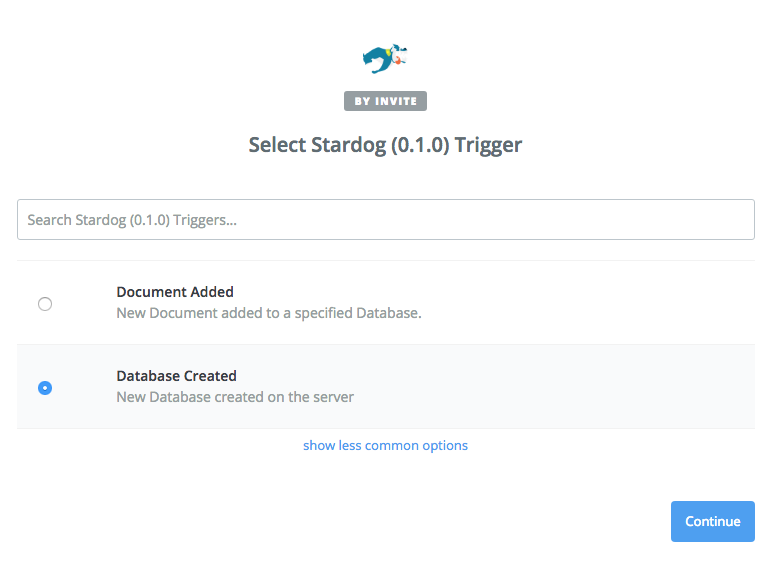 The Stardog integration into Zapier includes several of both of these. Let’s dive into the details. 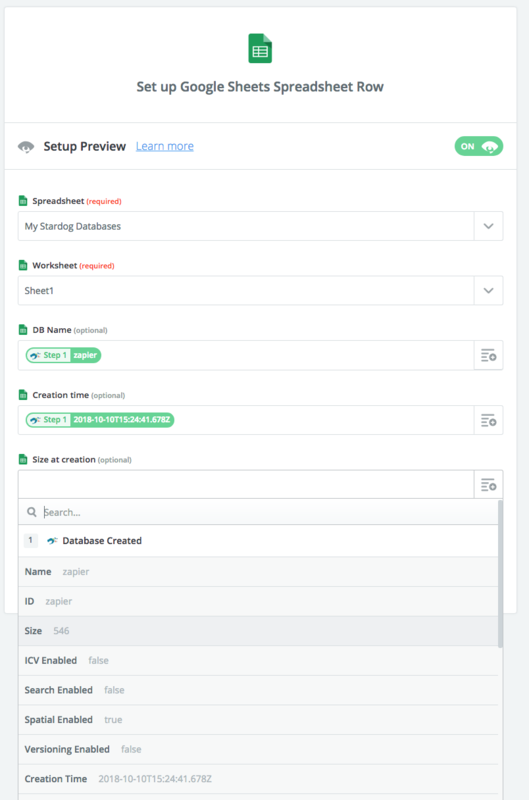 Database Created - When a new database (that the authenticated user can see) is created, this trigger returns a subset of its metadata, including name, creator, reasoning type, and size. Document Added - Monitors a specific database for new documents loaded via BITES. Returns metadata about the file, including name, length, and MIME type, as well as the document itself as a stream. User Created - Triggers when a new user is created on the server, returning the username, the user’s roles, and whether the user is enabled and/or a superuser. 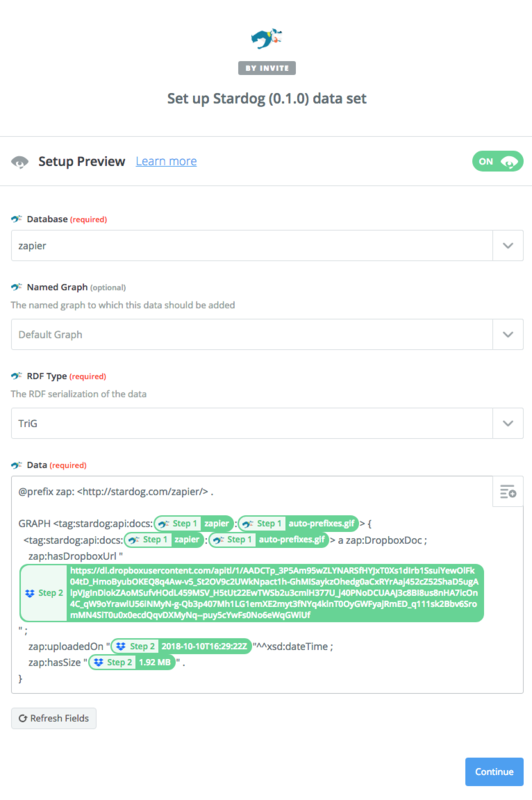 New Named Graph - Monitors a specific database for data being added to a new context/named graph. Returns the URI of the graph. Find Database - Given a database name, retrieves its metadata. Find Entity - Executes a SPARQL query against a chosen database with the goal of finding the URI of some entity in that database. Returns the first bound variable in the first binding that it finds, with the assumption that it is a URI. 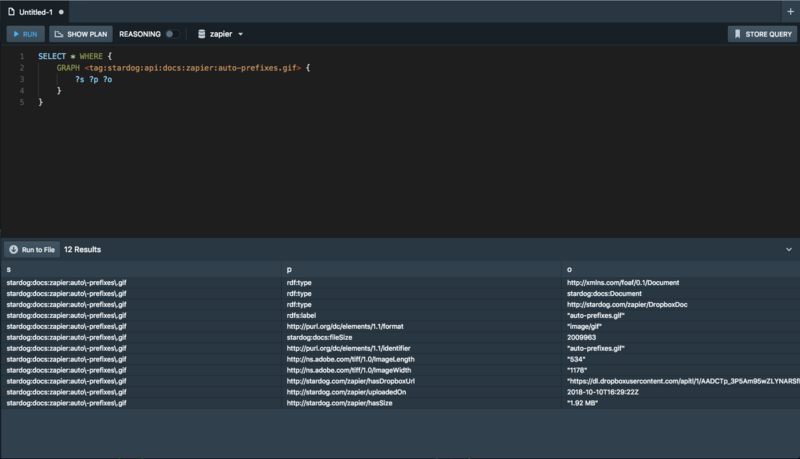 Find SPARQL Binding - Executes a SPARQL query against a chosen database and returns every binding in the first returned binding set. Find SPARQL Bindings - Executes a SPARQL query, however the return value is a blob of JSON/XML/CSV text containing the entire result set. 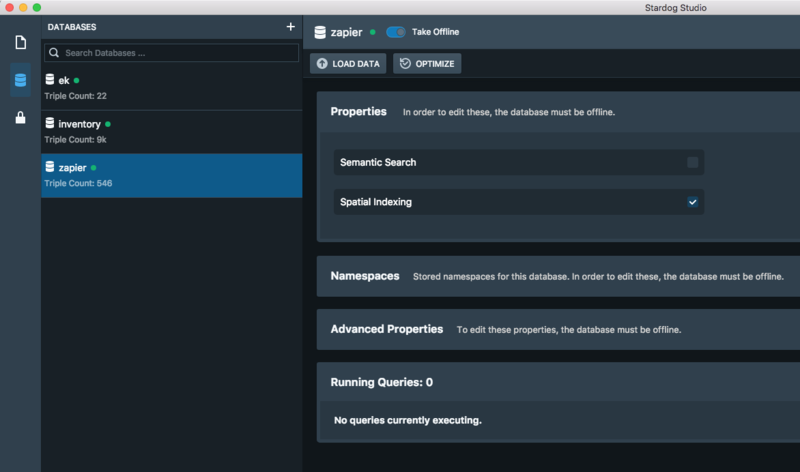 Add Data to Database - Adds a block of RDF data to the specified database or to a new database that can be named by the zap. Add Document to Database - Adds a file to a database’s document store via BITES. File can either be a file streamed from an earlier action, a URL pointing to a file, or a block of text entered directly into the zap. Execute SPARQL Update - Runs a SPARQL update query against a given database. Recommended for advanced users only, as data can be deleted this way. The next step is to choose the action we want the data from this trigger to flow into. Obviously, we want Stardog! 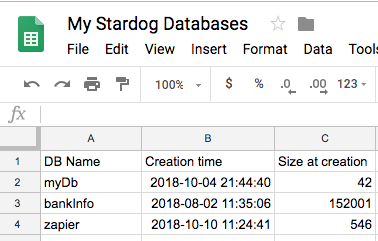 Finally, we need to set up our “Add Document to Database” action by populating the database name from the drop down (Zapier will reach out to the server to get the available databases) as well as the file name, which we choose from Step 1. Our options are then to send in a File object itself or a block of text. 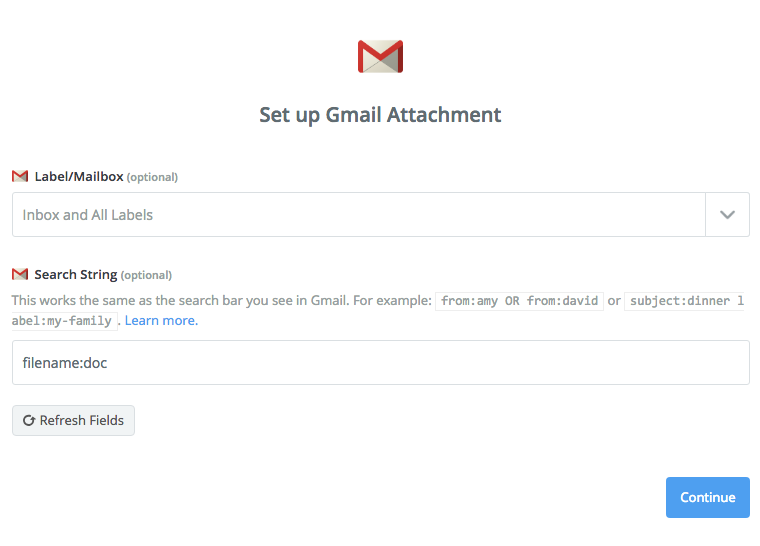 Since Gmail happily gives us the file with the Attachment key, we choose that. And we’ll also see the attachment in our database’s BITES store. Piece of cake! Trigger->Action may be the most common type of Zap, but you can combine multiple actions to do some pretty powerful stuff. 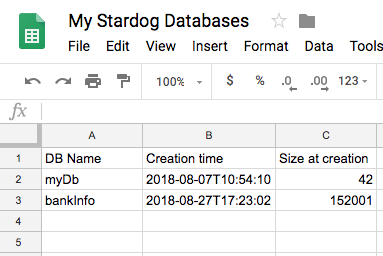 For example, what if when we added a document to BITES we also wanted to store it in a Dropbox account, and then put metadata from that Dropbox file back into Stardog? We can absolutely do that. This work represents a minimal suite of what we’d like to implement with Zapier. Going forward we plan to listen to user feedback to implement triggers and actions that people find necessary. 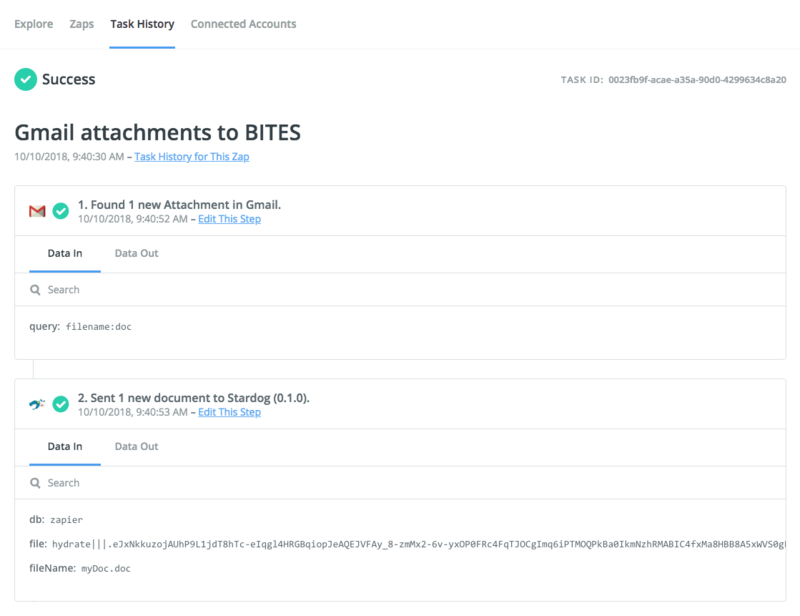 We’d also love to write up some transformation tools from <insert data type here> to RDF, so that Zaps like the Dropbox one above are a little easier to pull off without needing to create RDF manually. 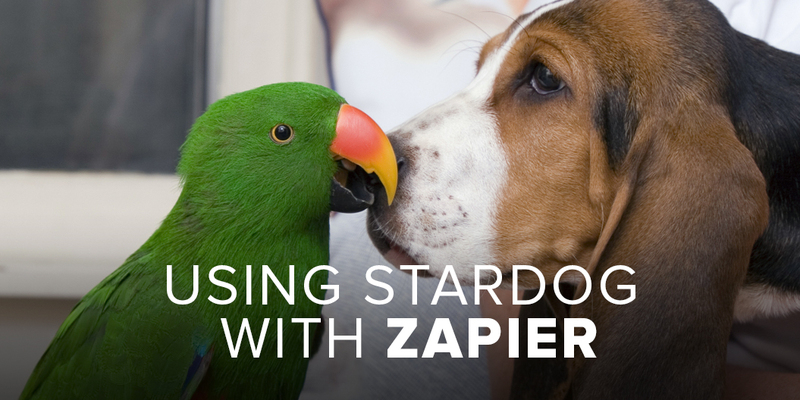 Hopefully this post has piqued your interest in Stardog’s integration with Zapier. 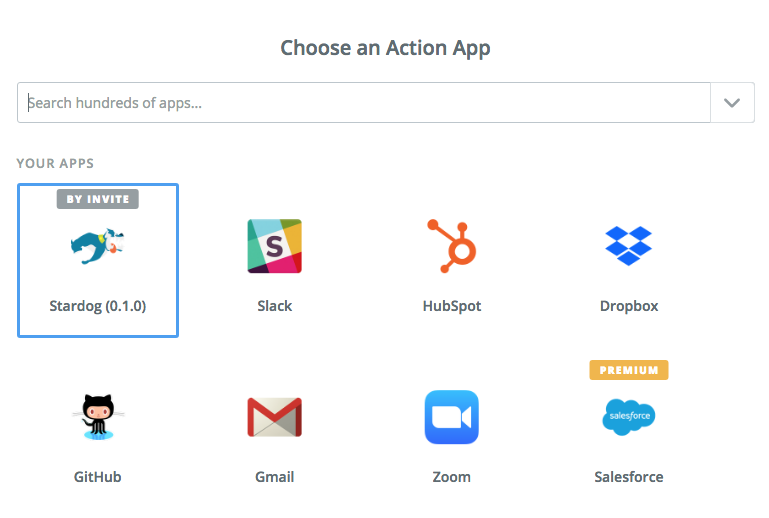 At the time of this writing, the zapier app has not gone publicly available, however this early-access page will allow your account to access it and play around. Let us know what you think!